Dolly Parton’s Dixie Stampede in Pigeon Forge is a dinner theater like no other. 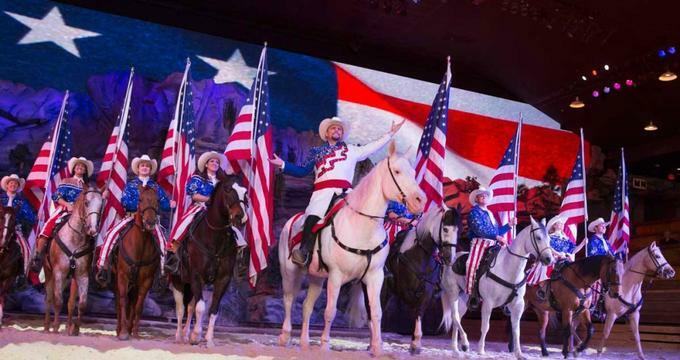 Here, guests are treated to a host of outstanding live rodeo performances over a four-course dinner, making for a unique kind of entertainment for the entire family. It is especially known for its beautiful performances during the Christmas season, when the arena is transformed into a magical place filled with snow, elves, and lots of holiday cheer. The location is close to everything, so it’s a must-see especially for those who are visiting Branson or Pigeon Forge. Family and friends of all ages and sizes will find that Dolly Parton’s Dixie Stampede is one of the best combinations of four-course dining and world-class entertainment out there. Dolly Parton’s Dixie Stampede hosts all kinds of performances. The shows’ times and schedules greatly vary depending on the day and the show itself. The shows for the Christmas season, for example, start from the afternoon on weekdays with more scheduled performances on Fridays and even more on Saturdays. The best way to check for schedules is to go online and check the calendar on the specific website; this is where reservations can be made as well. Reservations are best done online since all the show times are listed and organized via an online calendar. Upon selecting the preferred date and schedule, guests will also be able to choose their seating and confirm any other add-ons available. Upon making reservations, guests should indicate whether they would prefer a vegetarian or gluten-free meal. Able to accommodate groups of as many as 1,100 people, Dixie Stampede offers special prices for reservations for parties of 15 or more. This is ideal for those wishing to have a special celebration for their families, business teams, work crews, and other large groups.